The University of Sheffield is proud to partner with Chevening and be part of the initiative to support the development of the world’s future decision-makers. Chevening is the UK Government’s international awards scheme aimed at developing global leaders. Funded by the Foreign and Commonwealth Office (FCO) and partner organisations including the University of Sheffield, Chevening scholarship recipients are personally selected by British embassies and high commissions throughout the world. The alumni of this scheme include presidents, policymakers, business leaders and scientists. More than 40 Chevening Scholars attended the event, representing universities from all over the UK and nations on every continent. 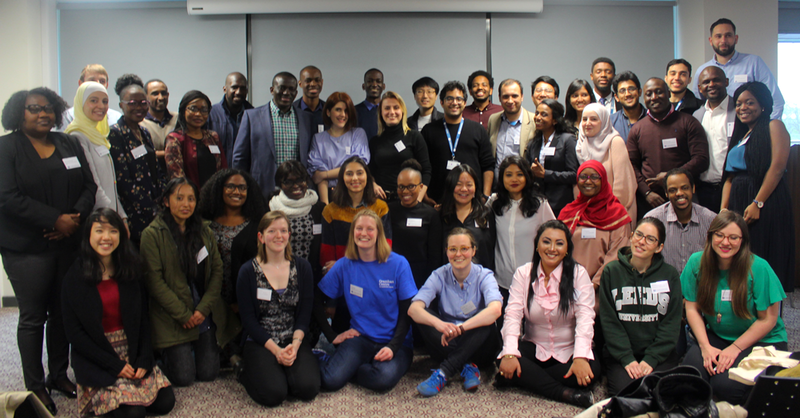 The Grantham Centre hosted a workshop for Chevening Scholars, exploring the subject of ‘Sustainable Futures’. Grantham Scholars Kaisa Pietilä, Joe Llanos, Florentine Weber and Amy Crum, and Grantham policy lead Mark Sinclair leading discussions on what a sustainable future might look like, who should take responsibility for this future, and how technological, social and cultural change can deliver food and energy sustainability. Tony Ryan talked about the lifecycle of plastic and Colin Osborneshowed scholars the environmental cost of meat. The day ended with a lively discussion about the responsibility of historically wealthy nations to reduce their natural resource consumption, the rights of less-developed nations to increase their energy use, and strategies for increasing food security for the poorest.